​Thinning hair and pattern hair loss affects about two-thirds of American men by the time they’re thirty years old, and nearly forty percent of women are affected by the age of 40. Hair loss attacks your self-esteem and leaves many searching for a cure with less than ideal results from popular treatments and products available that promise to slow or stop the process. PRP Hair Restoration promotes new hair growth by stimulating the blood flow to the scalp and commanding growth factors and cytokines to the hair follicles to ramp up production. PRP Hair Restoration can not only help you maintain the hair you have but also help regrow hair in places that have recently lost strands. Gain your confidence back and look younger with PRP Hair restoration. 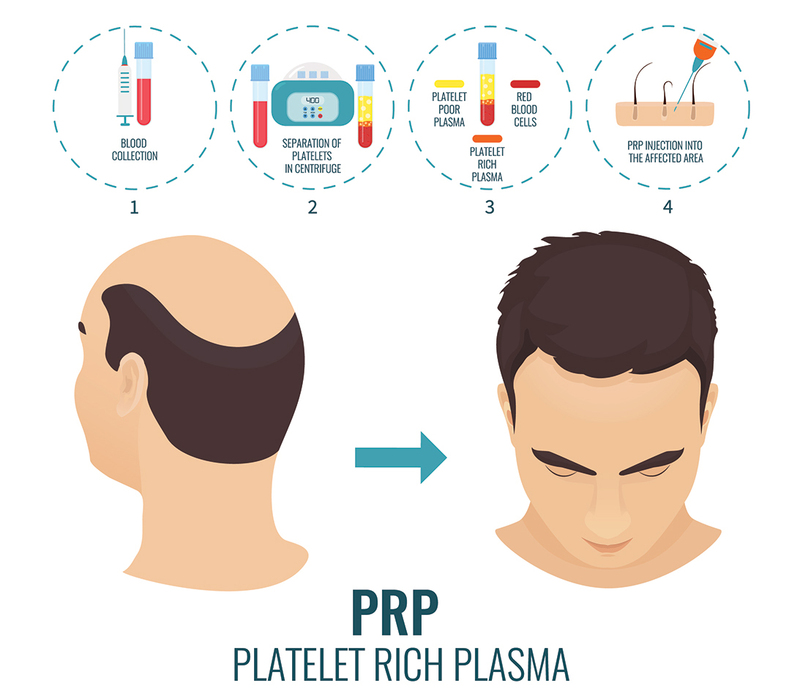 The PRP or platelet-rich plasma used for your PRP Hair Restoration comes from your own blood. Platelets are natural conductors of healing. They are rich in growth factors and are the body’s first responders after an injury. Platelets rush to the area and initiate the clotting process while calling stem cells to the area to begin their regenerative work. Platelets also release cytokines; these proteins help manage the bodies inflammatory responses. To start the process to isolate your platelets you will need to provide a blood sample through a simple blood draw. The blood is placed into a centrifuge that separates the platelets. These platelets are concentrated, so your body’s natural healing capabilities are concentrated anywhere from three to five times their potency for optimal performance. That platelet-rich plasma serum is then used to rejuvenate, repair and return normal function to your scalp and hair follicles. The PRP Hair Restoration treatment begins with a simple blood draw from the patient to collect a minimal amount of blood for the procedure. A local anesthetic is applied to the scalp to reduce any discomfort while your specialist performs a procedure called micro-needling to prepare your scalp for the PRP treatment. Micro-needling involves pricking the skin with ultra-thin needles. Micro-needling stimulates the blood flow and tissue to improve the performance of the platelet-rich plasma. The total procedure usually takes about 30 minutes. For optimal results, a second treatment may be scheduled within three months of the initial treatment to encourage continual growth. Although individual results may vary, patients who undergo PRP Hair Restoration have highly successful results. The process is quick and discreet and is a safer approach than topical creams full of chemicals and risky hair transplant surgery. If you want real results from a hair replacement treatment call us today to schedule your free consultation to meet our doctors and talk more about your hair goals. Turn back the effects of your hair loss by using your body’s natural healing power.